The San Gregorio Magno al Celio. 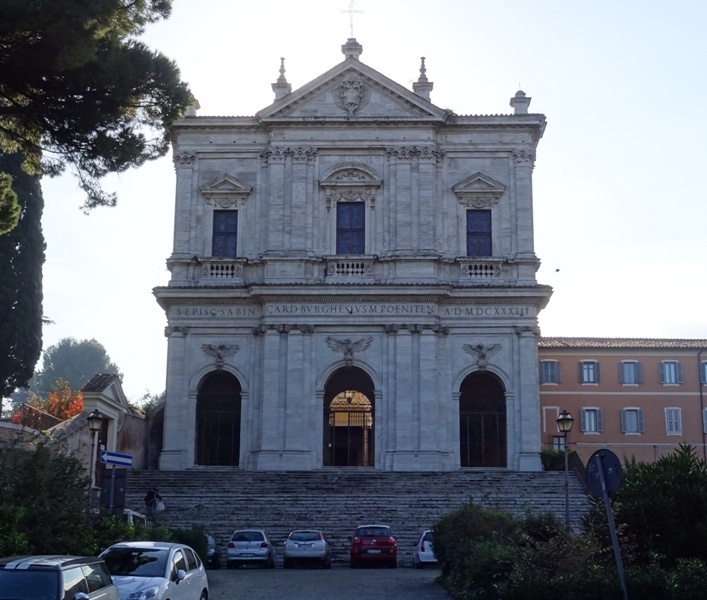 I have previously discussed three churches on the Caelian Hill: the Santi Giovanni e Paolo, the Santa Maria in Domnica and the Santo Stefano Rotondo. One church is still missing: the San Gregorio Magno. If you approach the Caelian Hill from the Circus Maximus, this is the first church you will see. It is hard to miss because of its imposing Baroque portal that can be reached by climbing an equally imposing set of stairs. There can be no doubt that this is a very old church, but its present appearance is relatively modern. According to tradition, a monastery and chapel were founded at this site in or around 575 by the future Saint Gregorius, who would fifteen years later become Pope Gregorius the Great (590-604). The monastery was dedicated to Saint Andrew the Apostle, brother to Saint Peter. Gregorius is best known for introducing the Gregorian chant – although there is no real evidence that it was his invention – and for sending missionaries led by Saint Augustinus of Canterbury to England. After his death, the monastery may have been abandoned, and it was certainly re-used and rebuilt several times throughout the Middle Ages. The present church may date from the twelfth or thirteenth century, and at some unknown point in time, it was dedicated to both Saint Andrew and Pope Saint Gregorius the Great. The correct name would be Santi Andrea e Gregorio al Celio, but nobody seems to bother to call it that. 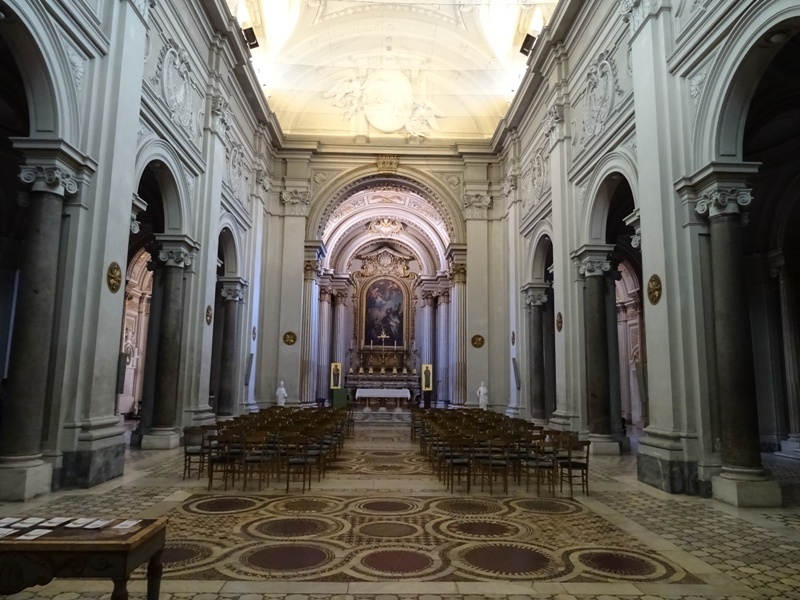 Saint Andrew appears to take precedence in the church, as the high altar is dedicated to him and Gregorius ‘only’ has a chapel dedicated to him at the end of the right aisle. The exterior and interior of the church are predominantly Baroque nowadays. The most important renovations were carried out between 1594 and 1734. Cardinal Antonio Maria Salviati (1537-1602) from Florence added the famous Salviati Chapel to the church (see below). Construction took place between 1594 and 1600. Then the famous church historian Cardinal Cesare Baronio (1538-1607) took over and ordered a complete reconstruction of the church. His work was completed by Cardinal Scipione Borghese (1577-1633). Cardinal Borghese also ordered the construction of a new portal, which was built between and 1629 and 1633 by Giovanni Battista Soria (1581-1651). The year of completion is mentioned on the facade of the portal in Roman numerals: MDCXXXIII. Hopefully Cardinal Borghese lived to see its completion, as he also died in 1633. 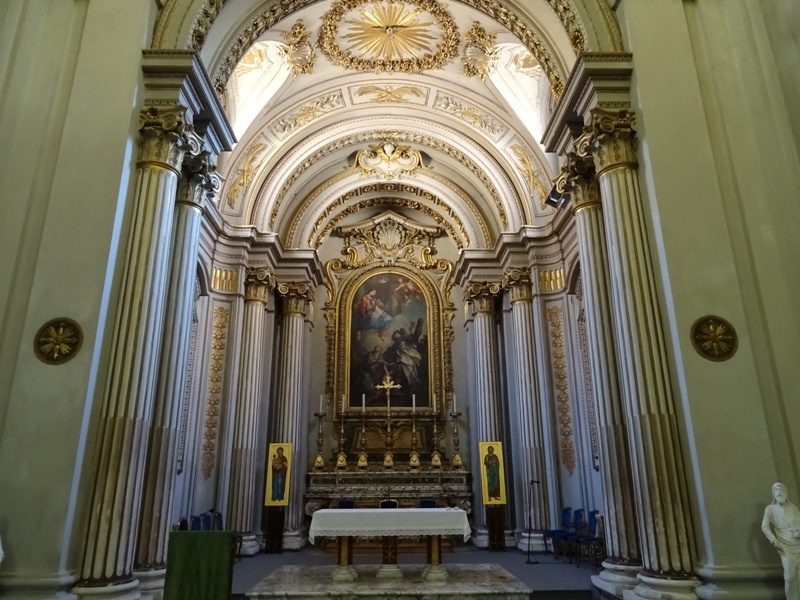 A remodelling of the interior of the church took place from 1725 until 1734 and was executed by Francesco Ferrari, an architect so obscure that he does not even have his own Wikipedia page. His renovation provided the church with the relatively simple interior that we can see today. The San Gregorio Magno seen from the Palatine. Tomb of Sir Edward Carne. Although I had often seen the church from a distance, I had not yet visited it until my trip to Rome in November 2015. When I climbed the stairs to the portal, I was in for a bit of a surprise. I assumed the portal was the facade of the church, but it is actually just a front for the atrium behind it (see the image above). The tombs of two Englishmen can be found in the atrium. Sir Edward Carne’s tomb is the most elaborate of the two. Carne (ca. 1500-1561) was a Welsh diplomat attached to the court of King Henry VIII of England. Many sources claim he participated in several missions to Pope Clemens VII (1523-1534) that sought to annul Henry’s marriage to Catherine of Aragon. Pope Clemens famously refused and Henry responded by founding his own church, the Anglican Church or Church of England. Carne later served Henry’s daughter, Queen Mary I of England (“Bloody Mary”). A devout Catholic, he preferred to stay in Rome after Henry’s other daughter Elizabeth – a staunch Anglican and supporter of the Protestant cause – acceded to the throne in 1558. Edward Carne died three years later. Queen Mary and her husband King Philip II of Spain are mentioned on his tomb. The other Englishman buried in the atrium is Robert Peckham (1516-1569). His tomb is plain and simple. There is a rumour that one of the most famous courtesans of Rome was also originally buried in the San Gregorio Magno. Her name was Imperia (ca. 1486-1512) and she was Sienese banker Agostino Chigi’s mistress (see Rome: Villa Farnesina). Imperia committed suicide for reasons which have never become clear. One version of the story claims that she was in love with one of her other clients, one Angelo del Bufalo, who refused to leave his wife for her. Imperia was reportedly buried in the San Gregorio, but her body was later removed because of her reputation. 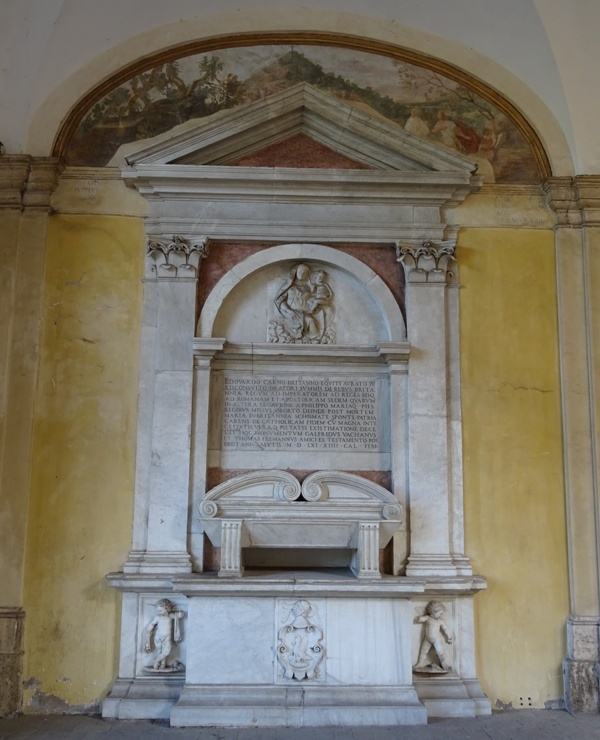 Elements from her tomb may have been reused for Lelio Guidiccioni’s tomb (1643), which can also be found in the atrium. There is no definitive proof, but it certainly is a good story. High altar of the church. The San Gregorio is a little unusual in that the visitor cannot enter the church through the front door. You have to ring a bell in the atrium and then a caretaker will open the door for you. You then walk through a corridor and enter the church through a side door. The church’s interior is relatively simple and not very colourful, except for the splendid Cosmatesque floor (see the image of the nave above). It is the original floor from the thirteenth century, which was fortunately spared during the eighteenth century renovation. Other churches in Rome have not been so lucky: the floor in the Santa Cecilia in Trastevere was destroyed and replaced for instance. But Francesco Ferrari apparently chose to relay the original medieval floor and for this alone he deserves a Wikipedia entry. The high altar is dedicated to Saint Andrew and above the altar is a painting by Antonio Balestra (1666-1740) showing The Madonna and Child with Saints Andrew and Gregory. 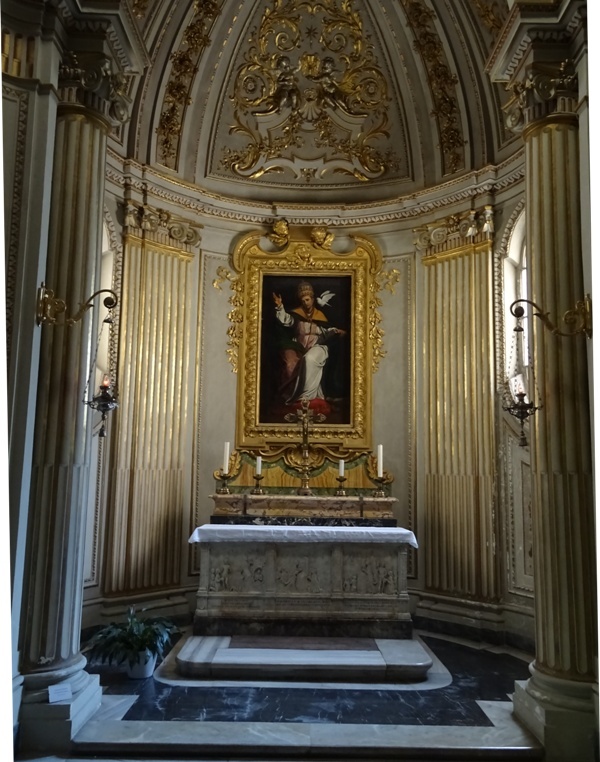 Chapel dedicated to Saint Gregorius. The chapel dedicated to Saint Gregorius the Great is to the right of the sanctuary, at the end of the right aisle. Most of the decorations in the chapel are from the seventeenth century. The altarpiece shows Pope Saint Gregorius inspired by the Holy Spirit in the traditional shape of a dove. It was painted by Sisto Badalocchio (1585-1647) in 1606. The altar itself has an interesting bas relief by Luigi Capponi (1582-1659). It contains scenes about the Gregorian Masses, a series of thirty consecutive masses aimed at releasing a soul from Purgatory. One of my sources claims the left scene shows Gregorius liberating the soul of the Roman emperor Trajanus (98-117), but that interpretation seems rather fanciful to say the least. The scene is much more likely about one of the monks in Gregorius’ sixth century monastery, one Justus. Chair of Pope Gregorius the Great. To the right of Saint Gregorius’ chapel is a little chamber where the saint reportedly slept on the stone steps of the stairs when he was still a monk. 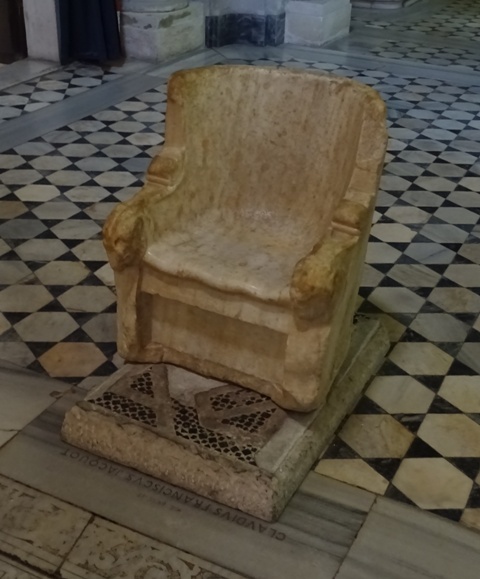 Just outside the chapel is a marble chair that Gregorius used after he had been elected pope. The chair is much older though. It probably dates from the first century BCE. 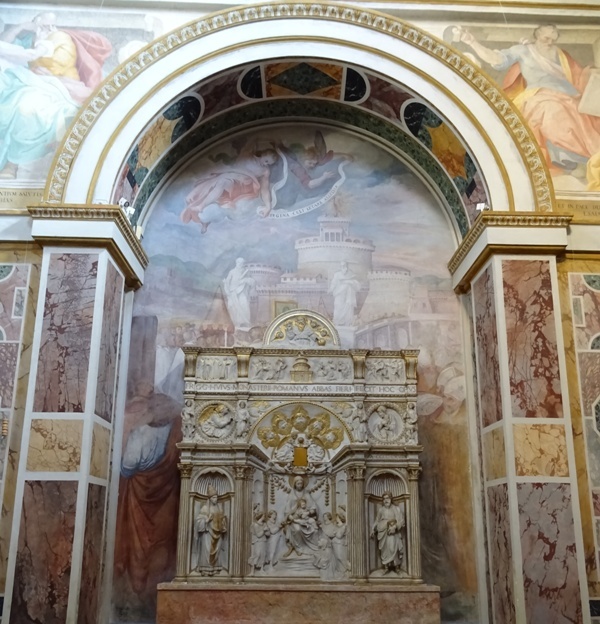 The Salviati Chapel is more than just any chapel. In fact, it is a small church in its own right. It was commissioned by and named after Cardinal Antonio Maria Salviati, who just lived to see its completion in 1600 (the cardinal died in 1602). Six years previously, Salviati had hired Francesco Capriani da Volterra (1535-1594; see Rome: Santa Pudenziana and Rome: Santa Maria dell’Orto) to execute the project, but he died before he could start. Carlo Maderno (1556-1629) then took over and completed the work. Cupboard in the Cappella Salviati. The most interesting piece of art in the chapel is a cupboard or ambry made by Andrea Bregno (ca. 1418-1506) and his school. The date on the cupboard reads 1469 in Roman numerals. The cupboard is gilded and it shows the Madonna and Child in the centre, with Saint Gregorius to the right and Saint Andrew to the left. The top frieze features the Castel Sant’Angelo. It shows scenes from another legend pertaining to the life of Saint Gregorius. When Rome was struck by a terrible plague in 590, the saint led a penitential procession through the city. When the procession was near the Castel Sant’Angelo – the former Mausoleum of the Roman emperor Hadrianus -, Gregorius saw the archangel Michael sheathing his sword, thus putting an end to the plague. This legend is retold by the fresco behind the cupboard, which is the work of Giovanni Battista Ricci (ca. 1537-1627). The real Castel Sant’Angelo is still topped by a statue of Michael the Archangel which shows him putting his sword back in the scabbard. San Gregorio Magno al Celio on Churches of Rome Wiki. Update 14 January 2017: pictures have been updated.